Brig. 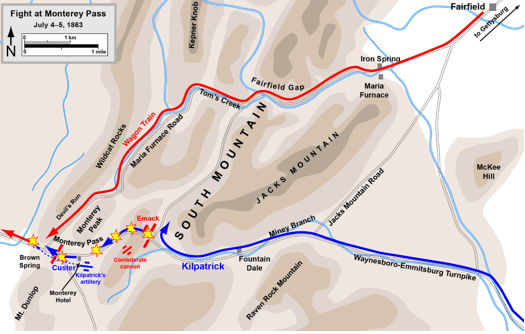 Gen. Hugh Judson Kilpatrick, U.S. Cavalry, Army of the Potomac commanded the attack at Monterey Pass and later tried to drive J.E.B. Stuart and his cavalry force from Hagerstown. Failing to do that, he and his men rode on and joined an ongoing attack on Williamsport. The Photographic History of The Civil War in Ten Volumes: Volume Four, The Cavalry. Public domain. While they weren’t involved in as much fighting with Union cavalry, the wagon train carrying the wounded faced some wholly different challenges and dangers as they rolled along to the Potomac. To be continued… Next, Imboden’s “train of misery” delivers the Confederate wounded to safety and his badly outnumbered force— trapped in Williamsport by the flooded Potomac— fights for survival. 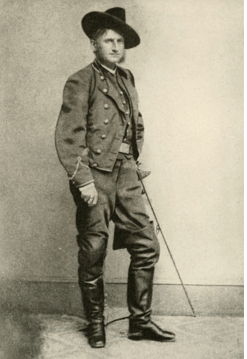 This entry was posted in Armies, Battlefields & Historic Places, Battles, Cavalry, Civil War Events, Leadership--Confederate, Leadership--Federal, Personalities and tagged Battle of Hagerstown, Charles Capehart, George Custer, J.E.B. Stuart, John Imboden, Judson Kilpatrick, Monterey Pass. Bookmark the permalink.